According to a new biography, former US president Barack Obama proposed to a woman he dated in the 80's who rejected his proposal twice before he met and married his wife, Michelle Obama. The woman is said to be Sheila Miyoshi Jager who is of Dutch and Japanese descent. The author of the new book, "Rising Star: The Making of Barack Obama," David Garrow, says Obama met Jager in the mid-'80s when he was doing community organizing in Chicago. Garrow said that when he interviewed Jager, she told him that even back then, Obama had a strong belief he'd someday become President of the United States. She also told the author Obama had "a deep-seated need to be loved and admired." Adding that in 1986 Obama asked her to marry him, but her parents were opposed because they thought she was too young to get married, so she turned him down, but they continued dating. Then, Garrow says, Obama's presidential ambitions became a centerpiece of their relationship, which caused a conflict between them because he worried that marrying a non-African-American wife would do him political damage. Garrow says he "felt trapped between the woman he loved and the destiny he knew was his." 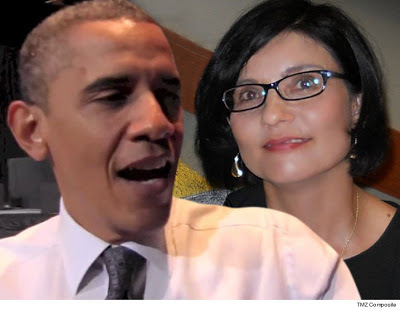 Obama then went to Harvard Law School in 1988 and the relationship became strained but Jager says Obama again asked her to marry him before he left, but she was off on a research trip to Seoul and rejected his proposal, for the second time. Obama then met and started dating Michelle after their first year in law school but, according to Garrow, he was still occasionally seeing Jager. But when he solidified his relationship with Michelle, he stopped seeing Jager. Jager, is now a professor of East Asian Studies at Oberlin College.